The Heartsine Samaritan PAD-PAK is an integrated battery and electrode system, including one set of adult defibrillation pads and battery. 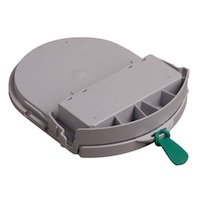 This is an innovative approach to maintenance, with AED batteries and electrodes in one single-use cartridge. This means there is only one date to monitor and only one item to replace on expiration or after use.